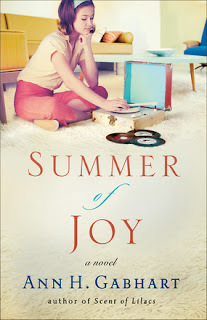 Book Review - "Summer of Joy"
"Summer of Joy" is the third book in Ann H. Gabhart's The Heart of Hollyhill series and it is a great addition to the series! Jocie is happy, David is feeling as if he has been given a second chance at love and married life, and things are going smoothly; however everyone soon finds out it will not last for long. As this family is attempting to become whole once again, they will encounter challenges, and triumphs, and also happiness and love. I have enjoyed this series, it has been quite the journey back to the 1960's. I love experiencing different time periods through books and I thought Ann did a wonderful job with highlighting the way of life during this time, especially what it would have been like for a teenager through the main character Jocie. I encourage everyone to read books 1 and 2 in this series first, "Scent of Lilacs" and "Orchard of Hope," as this book wraps up the series nicely and you will not want to miss out time spent with these characters and in this community. Book Review - "Wildwood Creek"
Lisa Wingate has done another fabulous job with her latest novel, "Wildwood Creek!" Not only is this a well-written story that will draw you in and keep your attention to the very end, but it is one that is filled with historical details and characters whom you cannot help but love. Allie is so thrilled to be following in her father's footsteps and she is willing to follow this dream. However, she is not prepared for the adventure that awaits her and the secrets. As more details from the past are revealed, the more mystery there seems to be, the more Allie feels as if there are secrets being hidden and she is not sure whom to trust. I love the dual storylines in this story as Allie's story is set in present day and Bonnie's back in the 1800's. The book flows so well between the two stories and I found myself wanting to read just a little bit more instead of stopping to get other things done. This completely held my attention with the twists and turns in the plot and I highly recommend this to anyone who has enjoyed Lisa's previous novels! I am looking forwarding to reading this book and I hope you will be as well! In Joyce K. Ellis' The 500 Hats of a Modern-Day Woman you’ll find strength, purpose, and perspective to balance your many roles—and gain insight into the roles of women around you. Want a helper for your modern-day journey? Enter to win a Kindle Fire in Joyce's "500 Hats" giveaway! Enter today by clicking one of the icons below. But hurry, the giveaway ends on March 30th. Winner will be announced April 1st on the Litfuse blog. Don't miss a moment of the fun; enter today and be sure to stop by the Litfuse blog on April 1st to see if you won. In The 500 Hats of a Modern-Day Woman you'll find strength, purpose, and perspective to balance your many roles-and gain insight into the roles of women around you. With honesty, humor, and practicality, Joyce Ellis helps you see how your roles can fit together to make a difference in your world. Questions for reflection or discussion at the end of each chapter make this book suitable for book clubs and small-group Bible studies as well. About the Author: Joyce K. Ellis, award-winning author of more than a dozen books, speaks for women's groups and retreats across the country and internationally. She and her husband enjoy reading by lakes and rivers and oceans, and spending time with their grown children and delightful, too-quickly-growing grandchildren. They live in suburban Minneapolis, Minnesota. I feel as if I am going non-stop in all different directions many days as I am a wife, a mother, a daughter, a daughter-in-law, a friend and a co-worker. Therefore, when I was given the chance to read and review Joyce K. Ellis' book "The 500 Hats of a Modern-Day Woman" I jumped on it! I thoroughly enjoyed every page of this book and this will be one that I will go back and read the entire thing or just parts of many, many times. This book hits it right on the head - there are so many roles that each woman wears day in and day out and it is overwhelming, stressful, and frustrating, but yet we are not alone and can really be turned into something positive and rewarding. The layout of this book is perfect as it is divided into well-defined sections, there are questions and thoughts to ponder at the end of the chapters and plenty of real-life examples and humor thrown in. This book is one that is easy to pick up and read when you have a few spare minutes waiting here and there and one that can be enjoyed when there is a chance to spend a longer time as well. I highly recommend this book to each and every woman as it will open your eyes to the roles you play and how you are letting them run your life and what changes need to be made. This is inspiring, enjoyable and eye-opening! Book Review - "The Kissing Bridge"
In the third book in the Seven Brides for Seven Bachelors series, award-winning author Tricia Goyer introduces a surprising new resident to West Kootenai as a young woman escapes from her stifling conservative Amish community to find a new life. Rebecca is an Amish woman whose pained past compels her to leave everything to become a nurse—abandoning her family and community. Caleb is an Amish man who is counting down the days until hunting season. At a crossroads in his own life, the excitement of hunting game is all he looks forward to. All the while he wonders what to do with the rest of his life. Even though he likes the Amish lifestyle, what good is an Amish man without faith in God? An unexpected meeting pushes them together, and they embark with friends on a two-week-long wilderness wagon journey. Hardship tears down the flimsy walls of protection they've placed around their hearts, and as their friendship grows they open up to each other and eventually reveal their deepest secrets. While on the outside they appear to be traditional Amish people, inside they both know they are anything but that. Will their secrets pull them together or draw them apart? And will their faith in God grow? There is a bridge to cross at the end of the journey. Will true love take them across? "The Kissing Bridge," written by Tricia Goyer, is the third book in the Seven Brides for Seven Bachelors series and it is a wonderful addition to this series! Rebecca has been living a secret life since her sister passed away as Rebecca is determined to help others avoid the complications that her sister did giving birth and decides to go to enroll in collage for nursing school. However, Rebecca is Amish and this would not be accepted by her parents and community. Finally the time has come for Rebecca to leave home, really leave, not just living her double life that she has been. As Rebecca begins this journey she encounters some complications, one being a man named Caleb. Caleb is also trying to find his place in the world as he is torn between his Amish community and the English world. This is such a sweet story and journey that these two individuals are on in their lives and I highly recommend this to fans of Amish fiction. It is a well written story and the characters were easy to empathize with; this is one you will not want to miss! DANCING WITH FIREFLIES || RSVP for Facebook Party & enter to win a Kindle HDX from Denise Hunter! Don't miss Denise Hunter's latest Chapel Springs Romance, Dancing with Fireflies. Reviewers have already labeled Dancing with Fireflies "swoon-worthy" and "the perfect love story." Join Denise in celebrating the release of her new book by entering her Kindle HDX giveaway and RSVPing for her April 10th Facebook party. Enter today by clicking one of the icons below. But hurry, the giveaway ends on April 10th. Winner will be announced at the Dancing with Fireflies Facebook Party on April 10th. Connect with Denise for an evening of prizes, book chat, and an exclusive look at the next book in the series. Don't miss a moment of the fun; RSVP today by clicking JOIN on the event page. Tell your friends via FACEBOOK or TWITTER and increase your chances of winning. Hope to see you on the 10th! Jade returns home to Chapel Springs after years of protecting her fragile heart. Then along comes Daniel, making her long to dance again. Creative and complicated, Jade McKinley felt like a weed in a rose garden growing up in Chapel Springs. When she left, she thought she'd never look back. But now, pregnant, alone, and broke, she has no other choice but to return. The mayor of Chapel Springs, Daniel Dawson, has been an honorary member of the McKinley family for years. While his own home life was almost non-existent, Daniel fit right into the boisterous McKinley family. He's loved Jade for years, but she always saw him as a big brother. Now that she's back, his feelings are stronger than ever. As Jade attempts to settle in, nothing feels right. God seems far away, she's hiding secrets from her family, and she's strangely attracted to the man who's always called her "squirt." Finding her way home may prove more difficult than she imagined. About the Author: Denise Hunter is an internationally published best-selling author. Her books have won The Holt Medallion Award, The Reader's Choice Award, The Foreword Book of the Year Award, and was a RITA finalist. In 1996, inspired by the death of her grandfather, Denise began her first book, writing while her children napped. Two years later it was published, and she's been writing ever since. Her husband says he inspires all of her romantic stories, but Denise insists a good imagination helps, too. When Denise isn't writing, she's busy raising three heroes-in-the-making with her husband. I was so excited to finally have Denise Hunter's latest novel, "Dancing With Fireflies" to read; it was such a long wait between "Barefoot Summer" and this one, but it was worth it! Denise dives right back into the lives of the McKinley family and back into the sweet town of Chapel Springs and I felt as if I had never left them! Denise does a fabulous job of reminding the readers of the previous story in the series by little comments in the first part of the book without backtracking too much which was great because it had been awhile since I had read "Barefoot Summer" and yet the story all came back to me once I began reading "Dancing With Fireflies." Jade was a character whom had a role in "Barefoot Summer," yet she had moved away and there was so much mystery surrounding her character and I was thrilled that she was the main character now! Jade has returned home and she is not willing to share the details behind her pregnancy as she believes it will only show how stupid she was and that she could not take care of herself. I really admired Jade throughout the entire book as I cannot even imagine having to hide her pregnancy for so long and trying to live life as normal as possible without rousing suspicions and trying to cover her own fears and doubts. Daniel is such a great hero in this story and I loved the roles that he played in Jade's life (the roles he has always played!) as he went from more than a family friend/feels like a brother (which he has always wanted to be more) to the person whom Jade confides in and trusts. Daniel and Jade are both dealing with issues in their lives and trying to find themselves and where they should be, and I love this story of each of these individuals finding themselves and each other. I am so happy that the next book will be out before the end of the year and I am looking forward to being back in Chapel Springs with this family! Book Review - "A Heart's Rebellion"
Ruth Axtell's latest Regency Romance novel, "A Heart's Rebellion," will sweep you back in time and into Jessamine's life. Jessamine has grown up a minister's daughter and has followed the rules; however she is now going to break them as she is tired of waiting on a man. Jessamine is determined, but still has a lot of growing up to do and has a lot to learn about the world, but her own self as well. As Jessamine is seeking her own path, Lancelot Marfleet is determined to get to know Jessamine better and is not put off by her attitude. As Jessamine continues to push him away and follow her own path, Lancelot is more determined and is very persistent as he follows his heart. This was an enjoyable read and I loved how this time period was brought alive with the vivid descriptions of clothing and society rules and expectations. Jessamine and Lancelot are both enjoyable to read about as they are well-developed characters and I felt as if I was truly on this journey with them. I highly recommend this book for anyone whom enjoys reading about this time period and those whom enjoy historical romance! Quilts of Love | A SKY WITHOUT STARS by Linda S. Clare – Kindle HDX Giveaway & “Spring Fling” Facebook Party! Don't miss this month's Quilts of Love book, A Star Without Stars, by Linda S. Clare. Linda is celebrating the release with a Kindle HDX giveaway and joining her fellow Quilts of Love authors, Barbara Cameron and Joyce Magnin, for a Facebook "Spring Fling" party on April 1st. Enter today by clicking one of the icons below. But hurry, the giveaway ends on April 1st. Winner will be announced at the "Spring Fling" Facebook Party on April 1st. RSVP today and connect with the authors from the Quilts of Love series, Barbara Cameron, Linda S. Clare, and Joyce Magnin, for an evening of book chat, quilt trivia, prizes, and an exclusive look at the next Quilts of Love book! Don't miss a moment of the fun; RSVP today by clicking JOIN at the event page. Spread the word—tell your friends about the giveaway and party via FACEBOOK or TWITTER. Hope to see you on April 1st! About the book: In 1951, Frankie Chasing Bear is a Lakota caught between cultures. She wants to raise her son Harold to revere his Lakota heritage, but she knows he will need to become as a white man to succeed. After his father's killed in a barroom brawl, Harold and Frankie move to Arizona, where she begins a Lakota Star pattern quilt for Harold with tribal wisdom sung, sewn and prayed into it. She distrusts Christians, as her own parents were forced to convert at an Indian School, until she meets BIA agent Nick Vandergriff, a half-Lakota who's also caught between cultures. Nick must convince Frankie that white men and Christians aren't all bad as he tries to win her heart in order to put the stars back into her sky. About the Author: Linda S. Clare is an award-winning coauthor of three books, including Lost Boys and the Moms Who Love Them (with Melody Carlson and Heather Kopp), Revealed: Spiritual Reality in a Makeover World, and Making Peace with a Dangerous God (with Kristen Johnson Ingram). She is also the author of The Fence My Father Built. She has taught college-level creative writing classes for seven years, and edits and mentors writers. She also is a frequent writing conference presenter and church retreat leader. She and her husband of thirty-one years have four grown children, including a set of twins. They live in Eugene, Oregon, with their five wayward cats: Oliver, Xena the Warrior Kitty, Paladine, Melchior, and Mamma Mia! I have been really enjoying reading the books in the Quilts of Love series and this latest one, "A Sky Without Stars," is a wonderful addition! Frankie is caught between two cultures and is trying to preserve her heritage and is wary of Christians. Nick comes into her life and he is determined to help Frankie see that Christians are not all bad. I really enjoyed this book and how this time period was brought to life. Native Americans have not been treated well throughout the years and the hardships they faced are portrayed in this book, yet also the love and healing that can come from finding a friend is portrayed nicely as well, as well as God's love. I highly recommend this book to anyone whom has enjoyed other books in this series. To read other reviews included on this book blog tour, go here! Book Review - "In the Shadow of Jezebel"
Mesu Andrews has become one of my favorite authors whom writes Biblical fiction, and she did not disappoint with her latest novel, "In The Shadow of Jezebel." There are many Biblical accounts that I am very familiar with and others that I am not so much; however when they are made into novels I feel like they truly come alive to me and it makes me want to go reread the story in my Bible. Jezebel has always been a fascinating woman to me as she is one of the "bad girls;" however she is also someone that we can learn lessons from as well, so the title of this book intrigued me right away. Jehosheba is the main character and the role that she plays is the main focus of this book; however there are many other characters and stories going on as well. The nation is divided at this time and there is so much hate and fear; however there is also love and God's grace as well. I highly recommend this book and once you start reading you will not want to put it down! “Real Women Leading” iPad Mini Giveaway and “Leading with Values” Facebook Party 3/20! Real Women Leading: With Proverbs 31 Values is a must-have leadership resource for today’s Christian woman. Lisa Troyer and Dawn Yoder are celebrating the release of their book with an iPad Mini giveaway and a Facebook "Leading with Values" author chat event on March 20th. Enter today by clicking one of the icons below. But hurry, the giveaway ends on March 20th. Winner will be announced at "Leading with Values" Facebook Party on March 20th. Connect with Lisa and Dawn for an encouraging discussion on how we can lead (at home and in the workplace) effectively and with biblical values. Win prizes, connect with other leaders, and be inspired. Don't miss a moment of the fun; RSVP today. Tell your friends via FACEBOOK or TWITTER and increase your chances of winning. Hope to see you on the 20th! About the book: Today's marketplace is not always a "values-friendly" environment. Business leaders Lisa Troyer and Dawn Yoder show you that you can live and thrive in a "valueless" workplace when you live by biblical values and principles. Real Women: Leading with Proverbs 31 Values is a must-have leadership resource for today's Christian woman. Written by women in the marketplace, Real Women cultivates biblical truth, credible relationship development, and practical application into everyday life through ten foundational principles. Once women embrace these ten principles, they will soon discover the multiple attributes of the Proverbs 31 woman in today's marketplace and learn practical ways to implement the wisdom from that timeless Scripture passage. Women will be encouraged to develop their God-given gifts and talents in the marketplace as they live out the principles that invite others to embrace the equality-inspiring values they live by. Knowing that we are not the end users of the gospel message, the Proverbs 31 leader will find the initiative to inspire the upcoming generation to view womanhood as a gift and continue the learning process that will impact generations to come. Lisa Troyer Sometimes referred to by friends as the "singing executive," wife, mom, radio personality, recording artist, speaker, and author. Her Circle of Friends women's outreach, formed over a decade ago, is growing in all directions. Lisa uses her gift of encouragement, her influence, and her resources to open doors for women to discover their significance and belonging. She and her family currently live in Ohio. Dawn Yoder is passionate about developing people to discover their strengths and reach their leadership potential. As CEO of a 500-plus employee company, she seeks to bring values and principle-based thinking into all aspects of society through a round table environment. Dawn is a member of the John Maxwell coaching team, an international trainer, a speaker with the Circle of Friends ministry, a contributing writer, a songwriter, and a frequent worship leader. She and her husband, Jeff, have been married for more than 20 years and have four children. Lisa and Dawn have written a fabulous book that Christian women of every age will want to read. "Real Women Leading with Proverbs 31 Values" is inspiring, down to earth and engaging. There are ten chapters in the book, each one focusing on a specific value and a specific woman from the Bible whom is an example of this value. The authors also share examples from their own lives and offer suggestions for the reader to help implement what is being shared in order to live out these values as well. I found this book to be wonderful as it is was very easy to read and I really loved delving deeper into these women's lives in order to learn more about how each one really lived out a certain value and how this is an example for each of us. I highly recommend this book and would love to see these two ladies team up in the future on other books as well. Book Review - "Murder Simply Brewed"
What will happen when two amateur sleuths, one Amish and one English, combine forces to solve the string of crimes happening in the Amish Artisan Village? Spring has arrived in Middlebury, Indiana, and Amber Wright can see profits in sight for her collection of Amish artisan shops—until she receives a call that Ethan Gray is dead. Hurrying over to A Simple Blend, she finds a single hole in the front window and Mr. Gray dead from an apparent heart attack. All the money is still in his register. Hannah Troyer takes over the shop’s duties, and she and Amber become fast friends as well as amateur sleuths. The police believe Gray’s death to be a by-product of vandalism, but Amber and Hannah aren't so easily convinced. Old Testament clues that don't add up, a neighbor who is pulled into the midst of the investigation, a town with secrets to hide, and blossoming romance—all will combine to push Amber and Hannah into unfamiliar roles in order to solve a mystery and bring peace to the Amish community. I loved "Murder Simply Brewed," book 1 in Vannetta Chapman's Amish Village Mystery series. This is a well-written story that has both suspense and romance. Amber and Hannah are both so different yet so alike and it was great to see what good friends they are although they are from two very different cultures. Vannetta does a fabulous job with bringing to life this town and this collection of shops as well as the characters. I was immediately drawn into this community and the characters' lives and did not want to stop reading once I started! This is quick and enjoyable read that will have you looking forward to book 2 in the series! Pre-order Distortion by Terri Blackstock for $4.99. Kindle Fire Giveaway and Facebook Party! Don't miss Terri Blackstock's latest release in the Moonlighters series, Distortion. The book releases March 11th, and Terri will be kicking off the release with a fun Facebook Distortion party and giving away a Kindle Fire HDX. PLUS readers can pre-order the ebook for just $4.99 between now and 3/11 everywhere ebooks are sold. Enter today by clicking one of the icons below. But hurry, the giveaway ends on March 11th. Winner will be announced at the Distortion Facebook Party on March 11th. Connect with Terri for a "suspenseful" book launch party with prizes, a book chat, and more. Don't miss a moment of the fun; RSVP today by clicking JOIN on the event page. Tell your friends via FACEBOOK or TWITTER and increase your chances of winning. Hope to see you on the 11th! About the book: Juliet Cole's life has been dismantled by the murder of her husband. She doesn't know who---or what---to trust when everything she has believed to be true about her marriage has been a lie. A husband's lies can have deadly consequences. When Juliet Cole's husband of fifteen years is murdered before her eyes, she thinks it was a random shooting. Devastated and traumatized, she answers hours of questioning, then returns home to break the tragic news to her boys. But a threatening voicemail takes this from a random shooting to a planned, deliberate attack. Juliet realizes that she and her children are in danger too, unless she meets the killers' demands. But as she and her sisters untangle the clues, her husband's dark secrets come to light. The more she learns, the more of her life is dismantled. Was her husband an innocent victim or a hardened criminal? Pre-order a copy for just $4.99 on Kindle, Nook, iTunes, or the eBook version on CBD until March 10th. About the Author: Terri Blackstock has sold over six million books worldwide and is a New York Times bestselling author. She is the award-winning author of Intervention, Vicious Cycle, and Downfall, as well as such series as Cape Refuge, Newpointe 911, the SunCoast Chronicles, Restoration, and Moonlighters. "Distortion," written by Terri Blackstock, is an exciting addition to her Moonlighters Series as book #2! Juliet's life is turned upside down in an instant, but she quickly finds out that not everything is just how it seems and she may be the next one dead. Terri writes in a way that draws the reader completely into the world with the characters and their lives. I became completely engrossed right away in this story as there are so many twists and turns and I wanted to know the truth. Juliet is seeking for the truth about the man whom she loved for so long as once her husband is murdered there are details about his life that are revealed and Juliet realized that he may not have been whom she thought. Although this can be read as a stand-alone novel, I would highly recommend that you read the first novel first as it is an exciting read and some of the characters are revisited in the second one. Book Review - "An Amish Garden"
Emma discovers a run-away teen in her barn, and the bishop asks her to provide a haven for a woman and her two children. Then her mother-in-law reveals a secret about her garden. Will Emma choose loneliness or learn to accept God's gifts? Rachael's garden is beautiful, but she is lonely. Gideon is in love with Rachael, but when Rachael finds her garden in shambles after a crisis, she rejects his help. Will she realize she doesn't have to do everything on her own? When a corporation shows interest in buying Sadie's heirloom seeds, she panics. They are all she has left of her Dat and Mem. Eli believes he can help Sadie, but a misunderstanding leaves her heartbroken. Will she trust him again, and will the seeds of a new relationship take root? Rosemary is doing her best to run her family's household. She excels at all her tasks except one: gardening. Saul has been interested in her for years, but Rosemary has turned him down repeatedly. Saul begins helping with her family's garden, but someone is sabotaging his efforts-and keeping a secret that could change their lives. Four wonderful authors: Beth Wiseman, Kathleen Fuller, Tricia Goyer, and Vannetta Chapman, have joined together and their stories make the latest novella collection, "An Amish Garden." This is a wonderful collection for right now, as I am ready for spring to come and this season of new growth and beginnings. In each of these four stories, gardening plays an important role, either as it is an escape for the main character or a thorn in her side. Either way, it helps each of these women in the novellas find love, peace and joy in their lives. This is a must-read for Amish fiction fans! I love the cover of this book and also the quote that is included on the back cover: "Gardens are a place to rest, to draw near, and to heal." The Thief Kindle HDX Giveaway from Stephanie Landsem! Don't miss Stephanie Landsem's outstanding sophomore effort, The Thief. Best-selling author Tosca Lee had this to say of the book: Filled with memorable characters, The Thief is a tale of hopelessness turned to hope, of high stakes made higher, and ultimate love. What happens when a character at the lowest rung of society crosses paths with the most well-known figure in history? The story of The Thief. I couldn't stop reading. Stephanie is hosting a Kindle Fire HDX and book giveaway at her website. CLICK THE BUTTON to find out more and enter to win. A Roman centurion longing for peace and a Jewish woman hiding a deadly secret witness a miracle that transforms their lives and leads them to the foot of the cross. Longinus is a Roman centurion haunted by death and failure. Desperate to escape the accursed Judean province, he accepts a wager. If he can catch the thieves harassing the marketplace before Passover, he'll earn a transfer away from the troublemaking Jews. Nissa is a Jewish woman with a sharp tongue and no hope of marriage. Only with the help of Mouse, the best thief in Jerusalem, can she keep her blind brother, Cedron, fed and a roof over their heads. When a controversial teacher miraculously heals Cedron, Longinus longs to learn more about the mysterious healer. Instead, his journey leads him to Nissa, whose secret will determine the course of both their futures. Longinus overcome their pasts to find a future free of their shackles? The Thief is an evocative story of two people trapped in their circumstances and the life-changing power of forgiveness and love. Stephanie Landsem loves adventure in far-off times and places. In real life, she's explored ancient ruins, medieval castles, and majestic cathedrals around the world. Stephanie is equally happy at home in Minnesota with her husband, four children, and three fat cats. When she's not writing, she's feeding the ravenous horde, avoiding housework, and dreaming about her next adventure---whether it be in person or on the page. "The Thief," written by Stephanie Landsem, is the second novel in her Living Water Series and one that should be read in order so that the reader does not miss out on anything from the story. This is such a well-written book of Biblical fiction. Stephanie does an incredible job with bringing to life these characters and the Biblical time period. You will escape into the lives of Cedron, NIssa and Longinus and your attention will be held until the very end of the book. This book delves into stories that the Bible that are known, but told by characters whom are not well-known and their points of view offer new perspectives. Great lessons and the love and power that Jesus has is apparent in this book and one that should not be missed out on by any historical fiction fan! To read other reviews included on this book tour, go here! Rachel Hauck’s “Princess Ever After” $200 Visa Card Giveaway & Facebook Party on 3/6! Enter Today | 2/13 - 3/6! Rachel Hauck is celebrating the release of her latest "swoon"-worthy romance, Princess Ever After, with a fun $200 "Princess" prize package giveaway and a Facebook "Princess" party on March 6th. Grab your tiaras and RSVP today! Enter today by clicking one of the icons below. But hurry, the giveaway ends on March 6th. Winner will be announced at Rachel's "Princess" Facebook Party on March 6th. Connect with Rachel for an evening of "royal" book chat, princess-themed trivia, laughter, prizes, and an exclusive look at the next book in the Royal Wedding series! Don't miss a moment of the fun; RSVP today. Tell your friends via FACEBOOK or TWITTER and increase your chances of winning. Hope to see you on the 6th! Regina Beswick was born to be a princess. But she's content to be a small-town girl, running a classic auto restoration shop, unaware a secret destiny awaits her. One that will leap from the pages of her grandmother's hand-painted book of fairytales. Tanner Burkhardt is the stoic Minister of Culture for the Grand Duchy of Hessenberg. When he is tasked to retrieve the long-lost princess, he must overcome his fear of failure in order to secure his nation's future---and his own. Yet lurking in the political shadows is a fierce opponent with sinister plans to abolish the throne forever. Overwhelmed with opposition, Regina must decide if she's destined to restore old cars or an ancient nation. Together---with a little divine intervention---Regina and Tanner discover the truth of her heritage and the healing power of true love. Meet the author: Rachel Hauck is an award-winning, best selling author of critically acclaimed novels such as RITA nominated The Wedding Dress and RITA nominated Love Starts with Elle, part of the Lowcountry series, the Nashvegas series and the Songbird Novels penned with multi-platinum recording artist, Sara Evans. Their novel Softly and Tenderly, was one of Booklists 2011 Top Ten Inspirationals. A graduate of Ohio State University with a degree in Journalism, she worked in the corporate software world before planting her backside in an uncomfortable chair to write full time in 2004. Rachel serves on the Executive Board for American Christian Fiction Writers and leads worship at their annual conference. She is a mentor and book therapist at My Book Therapy, and conference speaker. Rachel writes from her two-story tower in an exceedingly more comfy chair. She is a huge Buckeyes football fan. I really enjoyed the first book in Rachel Hauck's Royal Wedding Series and I enjoyed the second book, "Princess Ever After," just as much or more! Regina's world is completely turned upside down in a moment when she is told that she is heir to Hessenberg via Tanner. Tanner is trying to fulfill his duty and the future of Hessenberg lies in the hands of Tanner and Regina. As Regina sorts through which world is actually hers, she and Tanner are both finding out who they are and what true love is. I loved the characters in this book, they are so down to earth and relatable. I loved the journey that these two go on in order to find themselves and watching their relationship with each other grow. I also loved the flashbacks to Regina's grandmother's writings and loved how they tied in with the story. I highly recommend this book for anyone looking for a sweet romantic read. 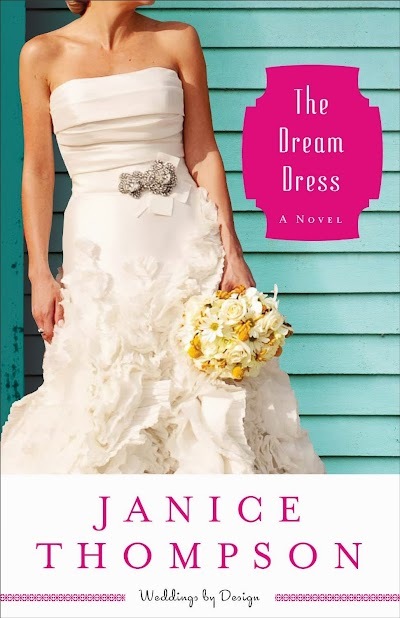 Book Review - "The Dream Dress"
"The Dream Dress," is volume 3 in Janice Thompson's Weddings by Design series and a great addition to this series! I am a huge fan of Janice's books beginning with the Weddings by Bella series right through this very latest book! I love all of the characters that have been introduced in Janice's books and how they continue to play roles in all of her books that come after. Gabi dreams of having her own business designing gowns and is working behind the scenes, which she is content doing as it pays the bills. However, that ends suddenly when chocolate lands on the bodice of a gown in front of a reporter, Jordan, and her boss. However, this is a first step toward changes both career wise, and personal life changes. Jordan and Gabi are both "stuck" in their lives and have issues to work through and the courage to take chances; will they take a chance on each other? I LOVE this series and each of Janice's books continue to get better and better! Each time I start one of her new books, I get immediately drawn into the characters' lives and transported to Texas. Each of these books is filled with loveable, quirky characters, and just fun stories that will have you laughing and wishing these characters were your best friends in real life. Chat with Janette Oke and enter to win an iPad Mini! Enter Today | 2/17 - 3/4! Janette Oke's newest book, Where Courage Calls (co-written with her daughter, Laurel Oke Logan), is receiving rave reviews. It is the companion story to Hallmark Channel's TV series When Calls the Heart, set in the Canadian west. Janette and Laurel are celebrating with an iPad Mini giveaway and a Facebook author chat party on March 4th. Enter today by clicking one of the icons below. But hurry, the giveaway ends on March 4th. Winner will be announced at the Where Courage Calls Facebook Party on March 4th. Connect with Janette and Laurel for an evening of book chat, trivia, laughter, and more! Don't miss a moment of the fun; RSVP today by clicking JOIN on the event page. Tell your friends via FACEBOOK or TWITTER and increase your chances of winning. Hope to see you on the 4th! About the book: Her courage and her heart will be tested in ways she never expected . . .
Beth Thatcher has spent her entire life in the safe, comfortable world of her family, her friends, and the social outings her father's wealth provides. But Beth is about to leave it all behind to accept a teaching position in the rugged foothills of western Canada. Inspired by her aunt Elizabeth, who went west to teach school several years ago, and gently encouraged by her father, Beth resolves to put her trust in God and bravely face any challenge that comes her way. But the conditions in Coal Valley are even worse than she'd feared. A recent mining accident has left the town grieving and at the mercy of the mining company. The children have had very little prior education, and many of the locals don't even speak English. There isn't even a proper schoolhouse. In addition, Beth's heart is torn between two young men---both Mounties, one a lifelong friend and the other a kind, quiet man who comes to her aid more than once. Despite the many challenges, Beth is determined to make a difference in the rustic frontier town. But when her sister visits from the East, reminding her of all the luxuries she's had to give up, will Beth decide to return to her privileged life as soon as the school year is over? Janette Oke Celebrated for her significant contribution to the Christian book industry, Janette Oke is the recipient of numerous awards. Her novels have sold more than 30 million copies and are beloved by readers around the world. Janette lives with her husband, Edward, in Alberta, Canada. Laurel Oke Logan is the daughter of Edward and Janette Oke, is the author of "Janette Oke: A Heart for the Prairie," as well as the novel "Dana's Valley," which she co-wrote with her mom. Laurel and her husband have six children and two sons-in-law and live near Indianapolis, Indiana. Janette Oke and Laurel Oke Logan have teamed up with their historical fiction novel, "Where Courage Calls." Beth is following in her aunt Elizabeth's footsteps and heading out to western Canada to become a teacher. This experience is not quite what Beth had in mind, but she determined to do what she set out to do. Beth is such an inspiring main character in this book and she was fun to read about. However, I also really loved the other characters as well, including Molly. Molly is such a good friend to Beth and is there for her. The two men whom are vying for Beth's heart are enjoyable to read about as well and I found myself liking them both and having a hard time trying to help Beth choose. This is a sweet story and an enjoyable story to read set in a rugged frontier that is filled with hardships, but also filled with wonderful people and memorable moments. To read other reviews included on this blog tour go here!